Sandro Caviezel continues to test the new Scheurer foils presented some months ago, this time with a brand new Landenberger Decksweeper by Felix Egner. 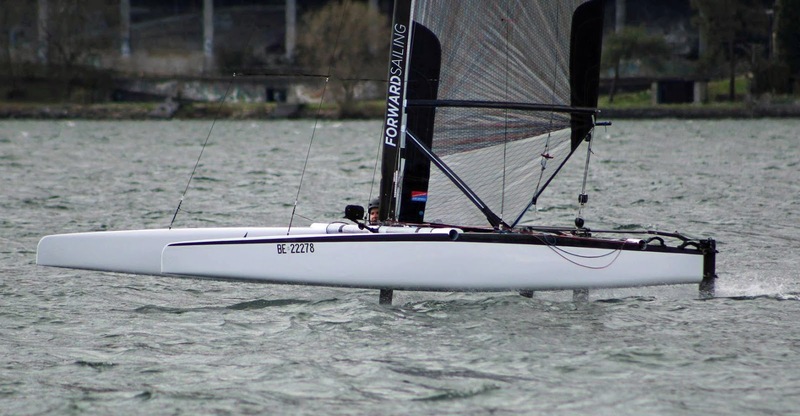 The Scheurer camp has an advantage regarding the platform re work seen lately in other brands, as beyond some fancy & cool aero addons, they don´t need to modify their hulls for the new full foiling mode (up & downwind) and can concentrate in optimizing foils & rig. In fact even the G6 platform is a perfect platform which already performed incredible upwind (A fact well known by all, but I also raced Andy Scheurer G6 at Bordeaux 2014 as a rookie, and I was impressed by its speed & pointing upwind). Sandro's comments; " You can make gains if the conditions are right but you can also lose a lot if you don’t get in rythm. It seems that when the breeze is up and the sea is rough you can make big gains. We will see how the performance will change with our new Aero-kit. Apparent wind is up when you’re doing 15-20 Knots Upwind so better put a wingsuit on ! 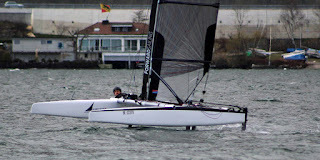 - In terms of handling upwind foiling is easier than downwind foiling." 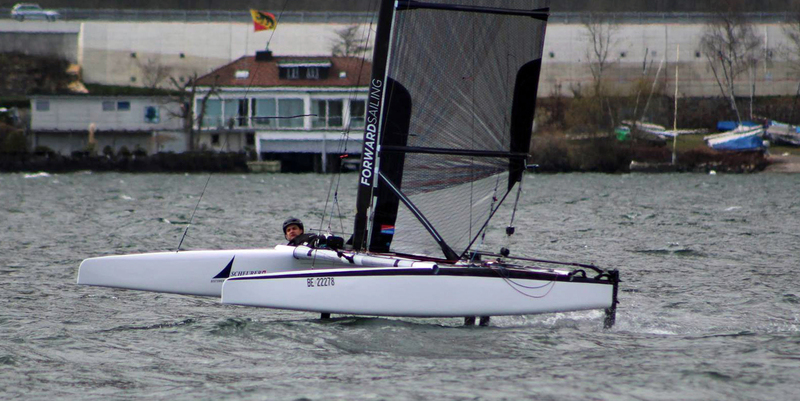 The Scheurer distinctive hull shape and low volume bow suits perfectly the new times, and remember Dna & Exploder have modified their hulls on latest 2016 version launchs. Along the Scheurer Gs there are some platforms like Melvin A3, Hall's Barracuda , Nikita and others which are perfect platforms to fit latest foils + decksweeper. The A-Class experienced a period of higher volume hulls in its latest floating stage, but with current flying foils and the generated lift , there is no reason now to keep volume up like is mandatory in the F18s for ie. In other platforms news, today I have started a new boat project, this time an A-Cat platform targeting costs but with no performance compromise. More details next months.